University of Washington scientists have succeeded in removing the extra copy of chromosome 21 in cell cultures derived from a person with Down syndrome, a condition in which the body’s cells contain three copies of chromosome 21 rather than the usual pair.A triplicate of any chromosome is a serious genetic abnormality called a trisomy. Trisomies account for almost one-quarter of pregnancy loss from spontaneous miscarriages, according to the research team. 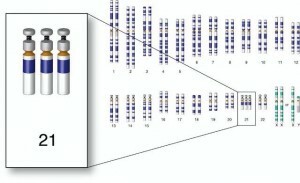 Besides Down syndrome (trisomy 21), some other human trisomies are extra Y or X chromosomes, and Edwards syndrome (trisomy 18) and Patau syndrome (trisomy 13), both of which have extremely high newborn fatality rates. In their report appearing in the Nov. 2 edition of Cell Stem Cell, a team led by Dr. Li B. Li of the UW Department of Medicine described how they corrected trisomy 21 in human cell lines they grew in the lab. The senior scientists on the project were gene therapy researchers Dr. David W. Russell, professor of medicine and biochemistry, and Dr. Thalia Papayannopoulou, professor of medicine. The targeted removal of a human trisomy, they noted, could have both clinical and research applications. In live births, Down syndrome is the most frequent trisomy. The condition has characteristic eye, facial and hand features, and can cause many medical problems, including heart defects, impaired intellect, premature aging and dementia, and certain forms of leukemia, a type of blood cancer. For example, he said, someday Down syndrome leukemia patients might have stem cells derived their own cells, and have the trisomy corrected in these lab-cultured cells. They could then receive a transplant of their own stem cells – minus the extra chromosome – or healthy blood cells created from their fixed stem cells and that therefore don’t promote leukemia, as part of their cancer care. He added that the ability to generate stem cells with and without trisomy 21 from the same person could lead to better understanding of how problems tied to Down syndrome originate. The cell lines would be genetically identical, except for the extra chromosome. Researcher could contrast, for example how the two cell lines formed brain nerve cells, to learn the effects of trisomy 21 on neuron development, which might offer insights into the lifelong cognitive impairments and adulthood mental decline of Down syndrome. Similar comparative approaches could seek the underpinnings of untimely aging or defective heart tissue in this genetic condition. The formation of trisomies is also a problem in regenerative medicine research using stem cells. Russell and his team observed that their approach could also be used to revert the unwanted trisomies that often arise in creating stem cell cultures. Figuring out the exact techniques for removing the extra chromosome was tricky, Russell said, but his colleague Li worked hard to solve several challenges during his first attempts at deriving the engineered cell lines. “Dr. Li’s achievement was a tour de force,” Russell said. The researchers used an adeno-associated virus as a vehicle to deliver a foreign gene called TKNEO into a particular spot on chromosome 21, precisely within a gene called APP, which sits on the long arm of the chromosome. The TKNEO transgene was chosen because of its predicted response to positive and negative selection in specific laboratory growth mediums. When grown in conditions that selected against TKNEO, the most common reason for cells to survive was the spontaneous loss of the chromosome 21 harboring the transferred gene. Other survival tactics were point mutations, which are single, tiny alterations in DNA base pairs; gene silencing, which meant TKNEO was “turned off” by the cell; or deletion of the TKNEO. Russell explained a key advantage of this technique for getting rid of the entire extra chromosome: Once it was gone, nothing was left behind. Other researchers on this study were Kai-Hsin Chang, Pei-Rong Wang and Roli K. Hirata. The project was supported by grants from Horizon Discovery and from the National Institutes of Health (DK55759, HL53750,GM086497, DK077864, and HL46557.) The researchers declared no financial conflicts of interest.